We embrace and can handle change. The more computers and features, the better. Husband-and-wife mechanics Jason and Janet Bigelow, owners of Advanced Tire & Auto Center on Highway 35 in Aberdeen, are the focus of a May 12 feature story by the Asbury Park Press. The article—“Car Repair is Computer Repair at Aberdeen Shop”—highlights the entrepreneurs’ niche focus on the kinds of advanced diagnostics and repairs that are typically available only at dealerships. In the piece, Jason describes how the auto repair business has transitioned from being largely mechanical to one that is increasingly digitized. “Back in the 1990s, cars had maybe two computers, but the average car today has nearly 40,” he told the APP. “So you almost have to treat cars like laptops when it comes to repair.” Having invested in 21 factory scan tools (diagnostic software packages for cars), Advanced is able to provide diagnostic and repair services for a wide range of domestic and foreign vehicles. “We’re the only shop on the East Coast to have this capability for so many vehicles…We consider ourselves ‘neurosurgeons for your car,’” Jason said. The 4,500-square-foot shop, which employs four technicians, provides customers with everything from transmission maintenance, to diagnostics for cooling systems, hybrid engines and advanced computers; to more traditional services such as oil changes; installation of batteries, shocks and struts; state inspections, factory-scheduled maintenance; tire sales and services; and wheel alignments. About Advanced Tire & Auto Center. 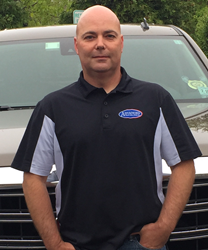 Advanced Tire & Auto Center, located on Route 35 in Aberdeen, Twp., N.J., was established by veteran mechanic Jason Bigelow in 1995, who now runs the business with his wife Janet, also a mechanic. Known for its focus on diagnosing and repairing state-of-the-art, 21st-century vehicles, Advanced Tire & Auto Center utilizes 21 factory O.E. diagnostic tools paired with well-trained technicians to perform the same level of service offered by dealerships, but at lower costs. Its comprehensive services include tire sales and service, fleet vehicle services, an on-site body shop, wheel alignments, “check engine light” diagnostics and much more. Press contacts: At Parness & Associates Public Relations, Bill Parness, bparness(at)parnesspr(dot)com or Lisa Kreda, lkreda(at)parnesspr(dot)com (732) 290-0121. At Advanced Tire & Auto, Jason Bigelow, Jason@advancedtireauto.com, Janet Bigelow, Janet(at)advancedtireauto(dot)com, 146 Hwy. 35 North, Aberdeen, NJ 07735, (732) 290-7300.